Taking fortune cookies to the next level by adding everybody's favourite, chocolate! Preheat oven to 350 °F (180°C). Spray canola oil onto two small 9 x 13 inch (23 cm x 33 cm) baking sheets. Before preparing cookies, cut out 12 to 14 paper pieces, 3 ½ inches long and ½ inch wide (9 cm x 1 cm), and write ‘fortunes’ on each piece of paper. In a medium bowl, whisk together egg whites, vanilla, almond extract and canola oil until mixture is frothy. In separate small bowl, sift together flour, cornstarch, salt and sugar. Stir in water. Add flour mixture to canola oil mixture and whisk until ingredients are combined and mixture is very smooth. Drop cookie dough, by tablespoons, onto one of the prepared baking sheets. Then spread dough with a small spatula until the dough is about 3 ½ inches (9 cm) in diameter. It is best to cook only three cookies at a time. Bake for about 14 minutes or until outer edge of each cookie turns golden brown and the cookies are easy to remove from the pan with a spatula. Remove one cookie at a time and flip it over in your hand. Place one of the fortunes in the middle of the cookie. (The cookies are very hot to handle so wear cotton gloves if desired). 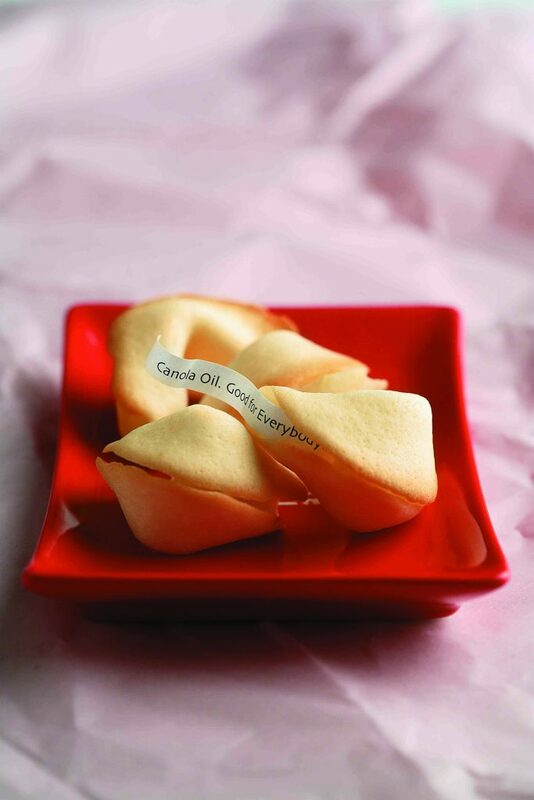 Quickly fold the cookie in half and then holding the outer edges of the folded half, gently press folded edge (browned edge facing up) over the edge of a glass to form the characteristic shape of the fortune cookie. 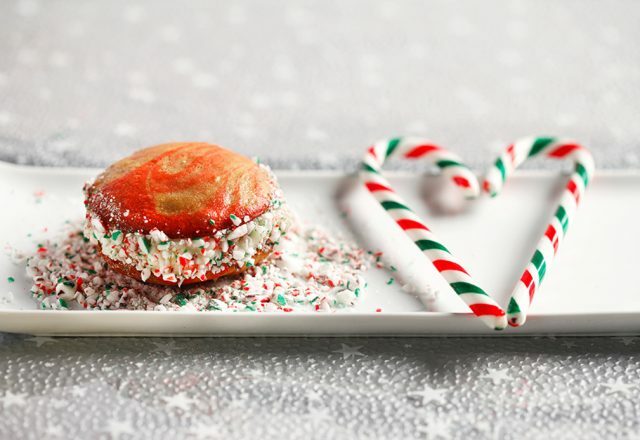 Quickly place into a muffin cup so the cookie will cool, in this shape. Once cooled, melt chocolate in double boiler. Dip cookies (whole, or just one tip) into the melted chocolate and lay on parchment paper. Let cool in refrigerator until set.